Unlike the Atomos Shogun Flame which supports SDI, HDMI and raw format, the Atomos Ninja Flame Recorder supports only HDMI formats and is meant to be a more affordable alternative to the Shogun Flame. Typical of all Atomos products, the Ninja Flame also comes packaged as a complete kit with battery charger, 2x NPF style batteries, HPRC hard case, five HDD/SSD caddy cases, USB3 dock, control cable and d-tap cable as well as sunhood. Undoubtedly the biggest technology leap in this 7", 1920 x 1200 on-camera recording monitor is in the display technology, the Atom HDR engine. Along with the 10 bit panel, the Atomos Ninja Flame Recorder has a brightness range of over 10 stops and allows you to monitor your log gamma footage in full detail in all its natural, vibrant colours. The new technology provides a highly effective solution to one of the biggest problems faced by videographers, watching perfectly well shot images turn into flat washed out images with important detailing cut off or lost in the play of shadows on the images while watching them on monitor through camera log. 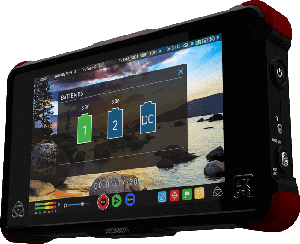 With the Atomos Ninja Flame Recorder the HDR log images display accurately with full brightness, it is like watching them with the naked eye. It is worthwhile to mention that the Ninja Flame supports logs from most major camera manufacturers including Canon, Sony, Panasonic, Nikon to name a few. The technologically superior AtomHDR engine, there is lots more that makes the Atomos Ninja Flame Recorder stand a class apart from the rest. One of the key features in the Ninja Flame is a calibrated 7" 1920x1200 325ppi 10 Bit panel with the capability of resolving more than a billion colors. The first of its kind daylight viewable field monitor, it also comes equipped with 1500nit panel technology that allows you change formats when required. So for instance in situations which do not require HDR log recording or 10 stops of dynamic range, images are typically compromised due to lack of brightness. But with the 1500nit panel, the brightness of the monitor remains intact so that even standard shots can be viewed in full brightness even in outdoor shooting environments. The hot swappable dual battery technology apart, what makes the Atomos Ninja Flame truly an exception in its category is its superior recording and DSLR audio monitoring capabilities. With features like Trigger Start/Stop recording, Pre-roll, 3:2 and 2:2 pull-down and Time-lapse, your audio and video recording abilities are guaranteed to go up several notches. With the Atomos Ninja Flame Recorder, you can see log just as the eyes would see it. Camera logs will deliver all sensor details for your recordings but the view from the monitor would look washed out and nothing comparable to what naked eyes could see. This makes it hard to judge exposure during recording and would require the use of LUT's just to get an approximate look. This then means sacrificing the use of calibration cards. The Atomos Ninja Flame Recorder is here to solve this issue and display HDR Log footage as accurately as possible. For those shooting situations that do not need ten stops of dynamic range, the 1500nit panel comes handy in monitoring Rec709 and sets the brightness high for the purpose of outdoor monitoring. When using the monitor, choose the correct mode between the HDR or High Bright modes. For precise and perfect shots, use the 1920x1200 resolution 7" LCD color display for accessing video set up tools or non- mandatory calibrations that will help overcome natural color drift. This monitor is simple to use and a touch away from helping users get perfect shots. The OS is non- complicated and comes with tools such as exposure, framing and focus and a 3D LUT implementation for top quality shots. The 4K range incorporates the continuous power which was pioneered on Atomos Ninja Flame HD products and power should not be a concern. The dual battery system allows for automatic swaps between batteries during shooting, and the fast batter charging system will ensure the dual 4-cell batteries are not drained of power. The Atomos Ninja Flame Recorder comes with HDMI recording functionality with some amazing features such as Pre-roll ( this defines a cache that ensures important moments are not missed during recording), and Time-lapse, which helps allow for recording freedom and maximization of creativity. You can also record and monitor audio using the 8-channels HDMI audio line or the 2-channel analog line. When using an external microphone, the monitor allows you to adjust, frame delays and mic levels. The monitor also offers support different brands of SSDs available throughout the world making it an affordable consideration.